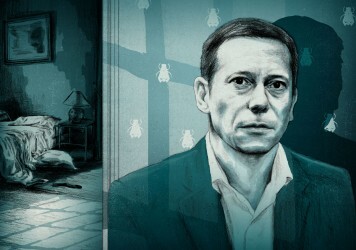 When the French actor Mathieu Amalric occasionally turns his attentions to working behind the camera, he accepts nothing less than a total, top-down reinvention. He clearly has no interest in making the same movie twice, and that goes for expanding on motifs or ideas from earlier works, or even sustaining a performance or shooting style from one film to the next. His previous feature, 2015’s The Blue Room, is an ultra-economical, bracingly curt murder mystery based on a George Simenon novel. This new one, Barbara, is not just in a different country or a different solar system, it’s in a different galaxy. It does the film no favours to describe it as a showbiz biopic of the mono-monikered French chanteuse, Barbara, as it’s so much more than that. Indeed, this a rare case of a biographical film that appears to pointedly avoid any information already available on the star’s Wikipedia page. 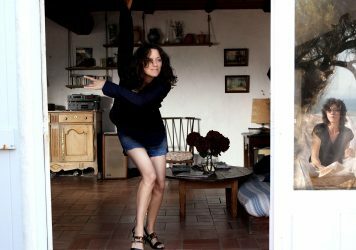 Long before the film hits its wild stride, we’re introduced to the actress Jeanne Balibar playing an actress named Brigitte who has signed on to star in a film about Barbara directed by Mathieu Amalric playing a director called Yves (keep up!). The suggestion that this is a film on the pitfalls of capturing a real person’s life on celluloid is rendered moot, as the story then takes surreal swerves every few minutes and refuses to bow to convention. 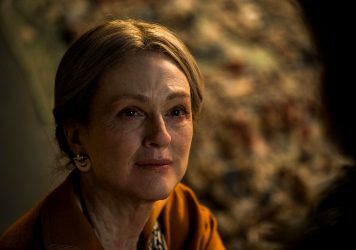 And with its buffet mix of live performances, movie-within-movie snippets and scenes of Brigitte taking great pains to mimic all the tics and inflections of her subject, the film offers emotional hit after emotional hit. There is no forward momentum, and little that connects one sequence to the next. And yet it works like gangbusters, largely down to Balibar’s astonishing central turn. She switches between Barbara’s off-stage diva antics and the shivering intensity of her concert performances, while always making it feel like this this is different shades of the same person. The dynamics and range on show are astounding, and her problems, her feelings, her sexuality and her politics shine though the words and the expressions rather than being stated outright. As Barbara is something of an unknown quantity outside of continental Europe, you do wonder whether the film will travel. But the spectacle of this shapeless wonder needs to be seen to be believed. Amalric is building himself an extremely impressive directorial oeuvre, and this might just be his crowning achievement. And Balibar is something else in the lead, an example of an actor not just inhabiting the skin of another person, but exhuming her from history and engaging in a precise piano duet.